Senior High campers will have a discussion type of interest group at lunch time (with the exception of the Missions interest group week one) and an active group at dinner time. Interest group sign up for summer 2019 will begin this Spring. We have left you the titles and descriptions from 2018 to give new campers an idea of the types of interest groups offered. Junior High campers rotate through selected interest groups. In Awaken, we will discuss how God brings you out of your sin that destroys you and into your newfound life for Him, as well as, His invitation to know you more and change the world with his gospel. Let's talk about leadership and what Godly leadership looks like in ministry, relationships, school, sports and all areas of life. In order to be a leader in anything, you have to have a heart after God’s, which means loving people above their opinion of you and being confident in God’s promises and ability to use us above our qualifications and weaknesses. This group will discuss the book and videos from Grace Is Greater by Kyle Idleman. We will use the powerful stories of grace experienced in the book and in our own lives to get to a better understanding of grace that is bigger than our mistakes, our failures, our desire for revenge, and our seemingly impossible situations. In How to Make a Best Friend, we will talk about what creates genuine relationships. We will discuss how we connect with others, the value of our technology, and sharing what matters most with the people we care about. Chuck and Dover will teach you how to open lines of communication and start connecting with others on a deeper and more meaningful level. Led by Charlie Prior and Jeremy Dover. This is a lunchtime interest group week 1 and supper time week 2. We will look at scripture that talks about serving others as we are the hands and feet of Christ on Earth. You will work, so plan to do physical labor and bring some extra “work clothes and shoes” with you because doing God’s work can be messy and you just might get dirty! As followers and disciples of Christ Jesus we are called to share the Gospel, the good news, of Jesus Christ. Learn how to connect the gospel message with your story, and how to share your story in everyday conversations with people you know. Join in taking a look at the church the way it is written in the book of Ephesians. In this group we will look at the relationship between faith and works, using the book of James as a guide. Join in a bible study that is just for girls. Come explore and discuss the bible in an all female group. This bible study is just for guys. Come explore and discuss the bible in an all male group. We will be doing mixed media but in a different style and with different media than the last couple of years. I will be teaching basic watercolor and drawing/shading techniques that will be combined into a piece of art on mixed media paper that you will be able to personalize into your own style. If you like to paint and/or draw you will love this project! Do you like to cook or Bake? I do....Come have fun with me and we will make something good. Colossians 3:23....Work willingly at whatever you do, as though you were working for the Lord rather than for people. Do you have an interest in magic? Do you want to learn how to use magic in ministry? 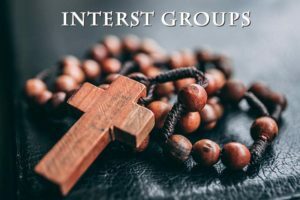 In this interest group you will learn how to do a magic tricks and then how to make it into an object lesson for ministry. Then you can use it to teach your friends or for a kids moment at your church or you could use it to show someone something about the Bible or God. Learn how to capture God’s beautiful creation forever. You will learn how to use photography and videography to show how great of an artist our God is. Your photos and videos will be used to make a slideshow to be shown at the end of the week. BRING CAMERAS AND VIDEO CAMERAS! This group learns new songs, black spirituals, and lakeside classics. Take part in the walking choir and sing for your camp peers during praise and worship. Do you like to dance? Here's your chance! Come learn how to express your love for God through the excitement of many dance styles with the gifts the Lord gave you. Fellowship of Christian Athletes. Have you ever wonder how you can honor God with your athletic gifts and abilities? In this very active, sport and activity filled interest group, learn how to use your athletic talents to glorify God. Explore this creative way to dig into God's Word using pen and paper. If you love words, if you love drawing or coloring, if you simply love to doodle or if you just think art supplies are awesome, then you will LOVE this! Bible journaling can help us express ourselves to God, while reminding us of his greatness. Special journaling Bibles are not required, nor is any artistic talent is required (seriously) - simply bring a regular Bible and a notebook. These are just examples of previous interest group. These are just examples of the types of interest groups that are offered at Lakeside For Youth. The 2019 groups will be posted in Spring 2019. You must be registered for camp to sign up for interest groups.